Are you new to the Known World and curious about what the hell is going on here? Do you have questions? Do you want to meet people, people who might be new like you, or people who've been around a bit? Then come eat your lunch with us. We will have tales of the history of the SCA and of Ealdormere, a few lessons on etiquette for Feast and Court, and a Q&A session. You will meet the Kingdom Chatelaine, and some generally friendly folk who can help guide you going forward. Our Social Media Deputy, Lady Marrin, has done a great job and has been working diligently in this position for three years now. She is currently looking for someone to take on this role as per her missive below. Deadline for applications is September 15, 2018.
your smartphone and snag the best seats at the tournaments? 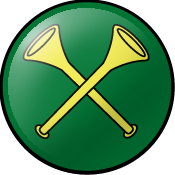 Consider applying for the position of Ealdormere’s Kingdom Social Media Deputy. Facebook, Twitter, Google+, Pinterest...and other social media accounts owned by the Kingdom. gentleperson who attends several events a year. office to take place at Fall Coronation. Greetings good people of Ealdormere! It has been a year since I have stepped into the role of Kingdom Seneschal, as such, I am beginning the process of seeking my successor. While I would not be stepping down until Spring Coronation 2019, I would like to have time to work with my successor prior to the change over the office. The deadline for applications isJune 30, 2018. Applications should include a letter of interest and your SCA and Mundane resume with relevant experience. Please send all applications to myself by email at ealdormere.kseneschal@gmail.com. Full details of the Kingdom Seneschal Role are out lined in Corpora, Kingdom Law, The Seneschal’s Handbook, and the Policies and Procedures of Ealdormere. VII-100 The Kingdom Seneschal is the chief administrative officer of the Kingdom and shall act as a signing officer in all contractual matters involving the Kingdom. VII-101 The Seneschal shall supervise the process of formation and advancement of local branches according to the Laws and operating policies. VII-102 The Seneschal will ensure that meetings of the Privy Council are conducted in an orderly fashion and that agendas and minutes of the meetings are issued promptly. VII-103 The Seneschal shall be responsible for reviewing the content of all proposed laws and law changes to ensure that they do not contradict existing Law or Corpora. The Seneschal shall maintain a current listing of Kingdom Laws. The Seneschal, in concert with the Chronicler, shall ensure that the Laws are published every 20 years. The Kingdom Seneschal shall ensure that changes to Kingdom Law will be made available to the subjects of Ealdormere on the Kingdom Website. VII-104 The Seneschal shall be responsible for soliciting bids for Kingdom events as defined in Article IV and for the maintenance of the Kingdom Calendar of Events. 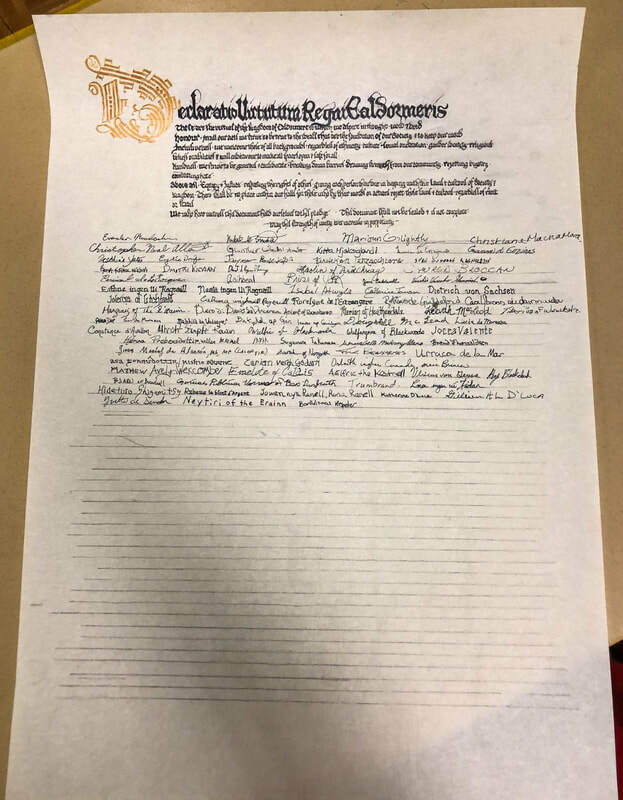 VII-105 Contracts involving the Kingdom may be entered into only by the Seneschal with the approval of the Crown, in consultation with the Privy Council. Such contracts must be signed by the Seneschal, following the procedures outlined in the Kingdom Operating Policies, Section One - Financial. Deputy of Youth and Youth Programs- responsible for organization of children’s activities within Ealdormere. If you have any questions about the position, please do not hesitate to chat with me, I would be happy to discuss the challenges and rewards with you. Due to circumstances beyond her control, Lady Steva finds herself unable to continue in the position of Kingdom Chatelaine. I want to thank for the wonderful job she has done over the past year and wish her well in her current and future endeavours. As a result, I am currently looking for a new Kingdom Chatelaine. Interested persons should send a copy of their letter of intent and SCA resume to myself at ealdormere.kseneschal@gmail.com by April 15, 2018. The intent is for the office to be taken over at Coronation on April 28, 2018. The office of the Kingdom Chatelaine is a deputy position under the Kingdom Seneschal responsible for assisting groups with strategies and resources to help recruit and support new and prospective members of the SCA and is potentially one of the first contacts new members have within the Kingdom. Experience organizing demos at ComicCon type events would be an asset, although not required. The person applying for this position should have a mind towards active recruitment. I look forward to hearing from those good gentles who are interested in this fun and rewarding position. Due to unforeseen personal life reasons I have decided that I need to step down from my role as Kingdom Minister of Arts and Sciences. It was not an easy decision or one I take lightly, but it is what I feel is best for my family and for Ealdormere at this time. I have chosen to do so now so that there is time for my drop dead deputy to properly plan the Kingdom Arts and Sciences Faire. Mistress Aibhilin fra Skye has already generously taken up the mantle and will be continuing until the changeover is complete. The goal is to choose a new minister for the Kingdom Arts and Sciences Faire (March 24, 2018) so that the new minister can help with the day and step up at court that evening. The role is expected to be a two year commitment, starting at the end of the Kingdom Arts and Sciences Faire in 2018 and stepping down at the end of the Faire two years later. Due to the short timelines, the deadline for applications is February 15. If you have any questions, please forward them to ealdormere.kseneschal@gmail.com. Thank you for your support during my time in office. This is the followup to the new policy. Please read and acknowledge. This is for distribution to all local Seneschals and event stewards/autocrats. By request of the Society Seneschal with the support of the Board and the President of the SCA, the following statement must be posted at gate/troll at every SCA event in a size large enough for people to see it as they enter our events. This language must likewise be quoted in ALL site handouts at every event a site were a handout is made available. Thank you for all for your cooperation. I would also like to thank Director Richard Sherman who distilled down this language from the most recent addition to the Seneschals Handbook as well as the President and Board of the SCA who have supported making the SCA a safer environment. THE SCA PROHIBITS HARRASSMENT AND BULLYING OF ALL INDIVIDUALS AND GROUPS. They then gave Their Excellencies of Septentria, Dafydd and Mahhild, leave to hold Court. Once Their Excellencies' business was concluded, Royal Court continued. The marshals of the various martial activities of the day were called forward and prizes awarded to the victors. Greetings to the Good People of Ealdormere! It has been brought to my attention that there are some questions and concerns in regards to how Kingdom Event Bids are chosen by the Privy Council. I thought I would walk through the process that a bid goes through when it is received by the Kingdom Seneschal, to clarify any misconceptions. The first thing that happens is the Seneschal reviews the bid to see if it meets kingdom guidelines, has a solid budget, and reasonable expectations for attendance, and so on, and will often ask the sponsoring group for clarification or ask for corrections or additions to make sure the bid will answer all the questions put forth by the Privy Council. After the bid is deemed complete, it is sent to the Privy Council email list and the Council reviews and discusses the bid. The Council members may have questions and concerns about the bid which the Seneschal will forward to the submitting group. Their response is then brought back to the council and either there is more discussion or an online poll is conducted to decide if the bid is acceptable as it is or, in the rare case there is more than one bid, a vote by each member of the Council is completed to decide which bid to proceed with. The King and Queen separately each get a vote, the Prince and Princess (if we have Heirs at the time of the vote) share a vote and each Greater Officer of the Privy Council is allotted one vote. It is a simple vote where the Majority wins, but the Crown must support the decision. With respect to the two bids we received for the March 2017 A&S Competition each person on the Council took the time to examine both bids and we had lengthy discussions in person and online. We clarified and requested some changes and then we held the vote online in order to allow the successful Canton to get started putting their event together. We did follow up with a brief discussion and in-person vote during our Privy Council meeting at Feast of the Hare. The meeting was open to the public. The minutes for that meeting are available in the Library section of the Kingdom website. When looking at bids, the Privy Council is looking at multiple different details to determine if a bid can result in a successful event. Please remember that the Kingdom relies on the profits from Kingdom events so it is essential that the bids reflect a profitable budget. Different council members may be looking for the things that impact their position on the Council (e.g. the Exchequer may focus on the financials, the Earl Marshal may pay particular attention to the marshal activities and the plans laid out in the bid, etc). Many council members are generically looking at the bid as a whole. Each Council member will ultimately vote for the bid that they feel is the best choice for the Kingdom. I can assure you that one of the biggest issues I have faced as the Kingdom Seneschal is a lack of bids for Kingdom events. In my time as Seneschal the 2017 A&S bidding process is the only vote between two bids that I have conducted. The others have all been polls of support for the single bid submitted. I would also add that in many cases getting that single bid was stressful, time-consuming and nerve-wracking. I was thrilled to receive the two bids that we received and I am so pleased that both groups are interested in running Kingdom events. I would respectfully suggest that if you are unhappy or unsatisfied with the way bids are selected, the location of the events or some other aspect of the bidding process that you get involved. I encourage you to apply for a position on the Privy Council when one becomes available and in the meantime volunteer for a position within your group, or volunteer for a position on a local or Kingdom bid to help run an event. Our Kingdom relies completely on volunteers. We can absolutely use more help. In February at the Service Symposium I will be running a class on how to put together a bid for a Kingdom event. I would welcome anyone interested in learning more about Kingdom bids to join me. We are also working on a brand new Steward’s Handbook that I believe will be a huge asset to all Event Stewards whether they are new to the job or experienced with a question or two.